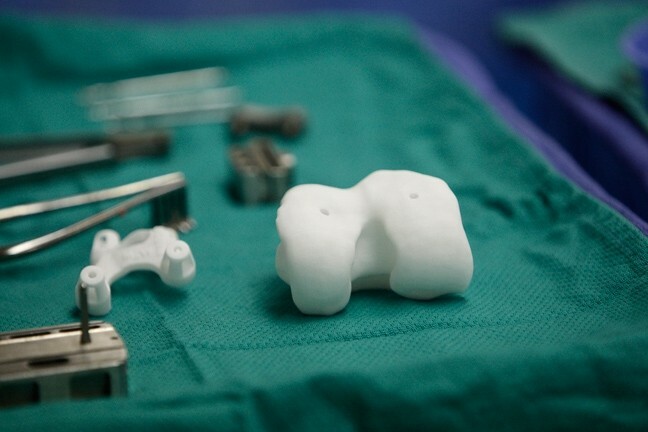 BONING UP : The surgeon employed a plastic model of a section of Ariel Waterman’s worn tibia. It’s official: I’m now a bionic woman, having had surgery to replace both knees; one in August and the other in November 2009. I was once quite athletic and loved skating at the local roller rink, whizzing around on four-wheeled boots. But just after my 21st birthday, everything changed. The rink had been cleared for speed skaters and I was flying. Straight ahead was a tot who had wandered into my lane. In an attempt to leap over her I landed hard on the wooden floor, my right leg bent in front and my left straight behind me. Every ligament was torn in the left knee, and life was never the same. My activity diminished and I began to put on weight, the bane of knees. At age 55, the pain in my knee joints had become unbearable. For some time, I had quietly endured it, taken NDAIDS to help quell the inflammation, and visited my chiropractor. Nothing worked anymore, and I walked with a pronounced side-to-side gait. I no longer enjoyed doing things that once gave me immense pleasure, like walking on the beach, meandering through museums, or exercising my dog. My chiropractor was the first to realize something was very wrong. Dr. John M. Ruda, D.C. has been practicing in Arroyo Grande since 1992. According to Ruda, if a patient doesn’t respond to chiropractic care, medical intervention is called for, and he has a network of medical doctors to whom he may refer patients. He refers someone each month for an orthopedic consultation for joint replacement. “A lot of times people just have an old bone injury that causes accelerated advanced osteoarthritis,” he said. “We help by keeping the spine aligned correctly to slow down that progression. It helps keep weight-bearing pressure off the affected area. In my case, Ruda became concerned when things began to degenerate to the point where excessive joint play became evident and my knee joints became unstable. Last July, he insisted I get an X-ray of both knees, so he could compare them side to side. The news wasn’t good. Both knees were in bad shape, but the left knee was worse. Bone spurs had formed, and my femur (thigh bone) was sliding inward off the tibia (shin bone) on both legs. Without surgery, over time, the joints would lay down more calcium and form more spurs, causing the joints to adhere and fuse, reducing mobility and range of motion to the point that I would require the use of a cane, walker, or even, in time, a wheelchair. Get thee to a surgeon! Dr. Marc W. Weise, M.D., has been an orthopedic surgeon for 20 years, has been practicing on the Central Coast for 11 years, and has had his own practice in Pismo Beach for the last four years. I met with Weise in July, a few days after Ruda had seen my X-rays. Weise had seen them, too. My left knee, he told me, had a build up of calcium at the medial collateral ligament—one of several I had ripped to shreds during that fateful accident at age 21. There was no cartilage left in either knee; they were bone against bone, and a varus deformity meant my joints were angling outward. That explained my side-to-side walk, called a Trendelenburg gait. Great, it had a name. I should apply to the Ministry of Funny Walks. But there was more. Weise also noted the bone spurs—what he refers to as “calluses of the bone”—that act as stabilizers. “The bone gets thicker and expands, like skin, when exposed to stress,” he explained. The result was that my femur was sliding medially on the tibia on both knees. He told me other possibilities, but said my best option, at this stage, was a complete knee replacement on both knees.“How does August 6 sound?” he asked. “Is he kidding?” I thought. That was less than three weeks away. My husband made the final pronouncement: “She’ll be there.” Well, that was that. At this point, Weise explained the type of implant, called an appliance, that I would have and how the surgery would progress. The term “knee replacement” is something of a misnomer. Only the cartilage on the ends of the bones is replaced. The replacement appliance features a metal alloy attached to the bottom of the femur, and plastic underneath the patella and on top of the tibia, to create a new joint that moves smoothly and without pain. Surgeries used to involve a long incision, up to 12 inches, made over the knee. Newer, minimally invasive surgery requires a smaller incision of about 5 to 7 inches, resulting in less tissue damage inside and out. It also can mean a shorter recovery period and better knee function because of decreased scar tissue. The damaged sections of the joint are removed and the femur and tibia reshaped to hold the appliance, attached with screws into the femur and cemented to the tibia. The new joint is further supported by the surrounding ligaments and muscle tissue. Knee replacements have come a long way since the first attempts in the late 1800s. Weise explained that early experiments included silver and even glass implants. I’ve heard of a glass jaw, but a glass knee? Another early procedure involved using soft tissue cut from the side of the hip, rolled up and stuffed inside the knee. Yikes! One of the first modern devices, the locked-hinged implant, made of stainless steel, worked like a door. It stabilized the knee, but movement was restricted to bending and straightening, and a normal knee doesn’t move that way. The early 1970s saw the innovation of unrestrained resurfacing of the knee, which allowed the natural ligaments to hold the knee in place. This procedure was an improvement because the range of motion for the knee was more natural and the appliances lasted longer. This was a major milestone, according to Weise, as was the distinction between left and right knees. Earlier appliances were adapted for use on either knee. Weise said experiments are now being performed with tissue engineering. It may soon be possible to grow bone and cartilage for implantation, although it can’t duplicate real cartilage, which has many layers. According to Weise, 90 percent of typical knee joint replacements will last for about 20 years. There’s no present data for anything longer than this because either the patients or the surgeons die. The American Academy of Orthopaedic Surgeons is now working to create a database containing a national joint registry to better track this information. BEHIND THE CURTAIN: Ariel Waterman has had knee replacement surgery on both knees. With help from the staff at Arroyo Grande Community Hospital and others, she’s moving, walking, and losing weight. The first order of business was an MRI of my hips, knees, and ankles, which was then sent to the company that manufactures the implants. Weise had explained that the older method of aligning the leg with the new implant involved inserting a rod into the marrow channel of the thighbone, to be removed once the appliance was in place. The alignment of the leg is now done by computer imaging, based on the MRI, which also calibrates the size, screw insertions, and cutting guides required to implant the appliance. The appliance is custom made for each patient and for their left or right knee. During surgery, I was to be put under general anesthesia and given a spinal tap to numb me below the waist. The surgical team consisted of my surgeon, Weise; an anesthesiologist; a first assist nurse, a scrub technician; and a circulator, who’s also an R.N. My surgeries were each scheduled for 6 a.m., which means the surgery team had arrived by 4 a.m. First Assist Nurse Mollyo Landry assists the surgeon during the procedure and never leaves the room. Some surgeries have lasted as long as 13 hours or more, and these nurses have serious stamina. Landry has been a nurse since 1971, and a first assist at AGCH since 1999. Shirley Fletcher, an R.N. for 15 years, was the circulator for both of my surgeries and has been with AGCH for two years. 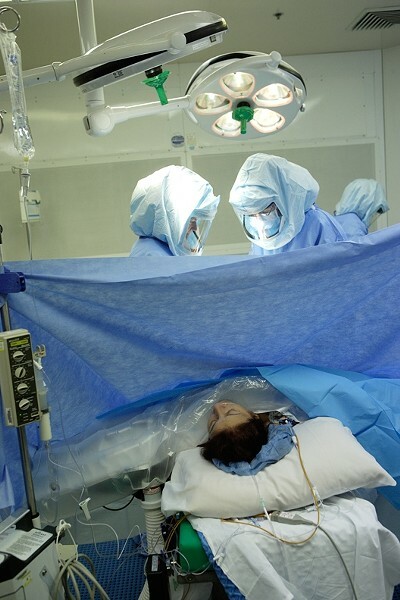 The circulator is the first person to meet with the patient before surgery. She gathers important patient information, including any allergies and when the patient last ate or drank anything. The circulator is really a patient advocate who protects the patient during surgery—including double and triple checking which knee is being replaced—and acts as a troubleshooter. She also serves as a liaison for the patient’s family, a service for which I was extremely grateful and that my husband found most reassuring. AGCH recently earned top honors for its joint replacement program from HealthGrades, the leading independent healthcare ratings organization, Scott said. A recent study by HealthGrades evaluated patient outcomes in 5,000 hospitals around the country. Arroyo Grande Community Hospital was recognized for its quality orthopedic care, and is five-star rated for its joint replacement program and total knee replacement for the seventh year in a row. Following surgery, I was hospitalized for five days. Weise said I would be out of bed and moving the day after surgery, and that physical therapy was to start right away. I discovered two things: When you have been on strong pain medication, it relaxes your bladder and guess what? The catheter I’d had was removed after two days. Talk about motivation to get up out of bed! The other thing I discovered was the Constant Passive Motion (CPM) machine and the ice pump. The latter looked like a small ice chest with a hose attached to a plastic pad wrapped around my knee. Flick the switch and cool water circulated continuously through the pad, alleviating pain and swelling. But the motion machine was my favorite. Padded with soft lambskin-like fabric, it cradled my knee and, when switched on, would bend and straighten my leg at a preset angle. I could lie back and nap while my leg was exercised for up to an hour or more. This made getting up and moving about much easier. I also learned that along with bending my knee, they wanted it to straighten. Flexion is attainable over time, but extension or straightening isn’t. There’s a very small window of time after surgery to get the knee to straighten perfectly at zero degrees before it can stiffen due to internal adhesions, thus reducing mobility and range of motion. After I was discharged from the hospital, Gentiva Home Health Services immediately stepped in and sent an occupational therapist and a physical therapist to work with me in the comfort of my home. A nurse also visited each week to monitor my vital signs and send reports to my doctor. Nicole Hemmers has been a physical therapist since 1997 and has worked with Gentiva for almost seven years. Hemmers visits patients in their homes within the first 24 to 48 hours after discharge, depending on the patient. Some patients have balance problems or are at risk for falls. She sees patients until they’re strong enough to go to outpatient physical therapy at the hospital or another location. My physical therapy continued at Arroyo Grande Community Hospital’s Physical Therapy Department. Headed by Ed Cardoza, PT, the department also holds a joint replacement class every Monday for potential surgical patients. I was required to attend this class prior to my first surgery. Cardoza covered every aspect of the procedure from the time I was admitted until I was discharged. Physical therapists Don Zimmerman and Robert Zvada worked with me for several weeks, encouraging and motivating me, as well as holding my hand when I cried—and I cried a couple of times! These guys meant business. Straightening the knee actually came quite easily for me, however bending was another matter. The ideal angle of bend is between 120 and 130 degrees. So far, I am at 116 degrees, but that’s because I have something every cowboy loves: fat calves! It’s hard to bend when the pudge won’t budge. The latest aspect of physical therapy is the use of a Wii to enhance balance. I sucked at most of the exercises, but aced the ski run and got pretty good at the yoga. Thanks to the physical therapists at Gentiva and AGCH, I now walk as straight as I did at age 21 without fear of falling, and I have lost 35 pounds so far since the first surgery. Two questions I asked Weise: Can my implants break or be injured? And do I have any limitations after recovery? He told me that some of the older steel devices can crack. He said 99 percent of modern appliances, including mine, are made of an alloy of chrome, cobalt, and the hard, stable metal molybdenum. Weise also said that knee replacements can be abused. Some patients think the new knee will last forever and continue the activities or the lack thereof that got them into trouble in the first place. He warned me that I wouldn’t benefit from jogging, running, competitive ball games, extreme hiking, or high-impact aerobics. I should also avoid the stairs. He said a second replacement surgery is more invasive with a longer recovery period, and long-term results aren’t always as good as with the initial surgery. Finally, with replacement knees, getting through airport security takes on a new meaning. Weise told me the little card patients get from their surgeons doesn’t mean much, as any terrorist can get one. Its purpose is to show the location of whatever metal you have in your body. My husband and I are quite the pair now when we try to clear airport security. We simply plan ahead, go a little early, keep a sense of humor, and it always goes quite smoothly. Contributor Ariel Waterman is enjoying her new knees. Send comments to the editor at econnolly@newtimesslo.com.